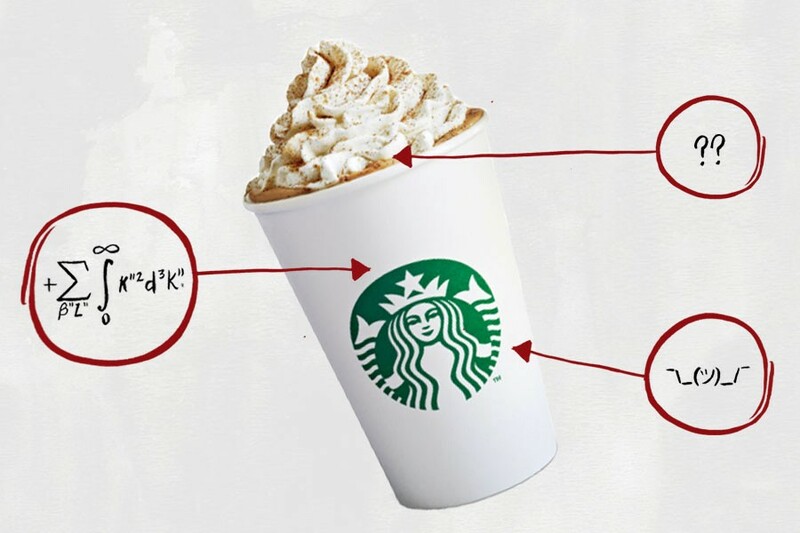 This edition: Starbucks Pumpkin Spice Latte, which is made from 23 separate ingredients that we’ve broken down in the exact order they appear on their website. The popularity of pumpkin spice can be almost solely attributed to Starbucks, who first released their pumpkin spice latte in 2003 (and proceeded to sell more than 200 million of the seasonal drinks within the ensuing decade). As for why pumpkin spice has become so incredibly popular since then, the explanation is some combination of nostalgia and seasonality—in parts of America where fall doesn’t always mean lower temperature and falling leaves (like our home base of L.A.), the availability of the pumpkin spice latte acts as the only real marker of the fall season. 1) Milk: The standard latte consists of espresso and steamed milk. Unless the customer requests otherwise, Starbucks baristas use two-percent milk to make lattes. 1) Sugar: A grande (16-ounce) pumpkin spice latte with whipped cream contains a whopping 50 grams of sugar, which is approximately 12 teaspoons—or the equivalent of more than two Hershey’s Milk Chocolate Bars. For reference, the American Heart Association recommends men consume no more than 36 grams and women consume no more than 25 grams of added sugar a day (that doesn’t include sugar found naturally in foods like fruits and vegetables, either). 2) Condensed Skim Milk: This is milk that’s been thickened by removing the water. *Sugar is also typically added to condensed skim milk during canning. * It’s often used in baked goods, desserts, and as a sweetener in coffee or tea. 3) Pumpkin Puree: This is cooked, pureed pumpkin. 4) Fruit and Vegetable Juice for Color: What exactly these fruits and vegetables are isn’t clear, but they’re more than likely added in insignificant amounts. 5) Natural Flavors: Natural flavor is quite literally flavor derived from an actual food source—i.e., pumpkin flavoring taken from real pumpkins. 6) Annatto: Derived from the seeds of the achiote tree, annatto contributes to the orange appearance of this sauce. 7) Salt: This is added to enhance the flavor. 8) Potassium Sorbate: Potassium sorbate is a widely used preservative, and it’s an ingredient to steer clear of: According to a 2010 study published in Toxicology in Vitro, potassium sorbate damages DNA when exposed to human blood cells; however, long-term studies on the effects of regularly consuming the ingredient are required to provide a definitive answer on the matter. 1) Brewed Espresso: This gives you life. Or not. 1) Cream: This is the fat-filled layer skimmed from the top of milk before homogenization. 2) Mono and Diglycerides: This is an emulsifier, and as we learned in our exploration of all 39 ingredients in the Dodger Dog, mono and diglycerides are oftentimes packed with trans fats that aren’t listed on the nutrition facts label, which is incredibly problematic. That’s because trans fats are associated with an increased risk of heart disease, stroke and diabetes, and consuming more than you think you are (because they weren’t listed on the label) could do serious damage to your body. 3) Carrageenan: “Carrageenan is widely used in the food industry for its gelling, thickening and stabilizing properties,” Dagan Xavier, ingredient expert and co-founder of Label Insight, told me during our analysis of the 16 ingredients in Starbucks mocha frappuccino. Some animal studies argue that there’s a connection between carrageenan ingestion and inflammatory bowel disease; however, the FDA lists the ingredient as a Generally Recognized as Safe Substance. And more recent human studies take the FDA’s side on this one. 2) Water: You drink this one when you’re not drinking pumpkin spice lattes (hopefully). 3) Natural Flavors: See above. 4) Potassium Sorbate: See above. 5) Citric Acid: Citric acid naturally occurs in citrus fruits, and it’s often added to foods to extend their shelf life. 1) Cinnamon: This is added for flavor. 2) Ginger: This is also added for flavor. 3) Nutmeg: This too is added for flavor. 4) Clove: Surprise! More flavor. The vast amount of sugar in a pumpkin spice latte is reason enough to stick with plain old espresso, but the addition of potentially dangerous preservatives, trans fats that may be hidden behind mono and diglycerides and the possible bowel-busting qualities of carrageenan make matters even worse for anyone attempting to celebrate fall with the help of this overpriced coffee drink. To anyone who spends all year looking forward to drinking this pumpkin spice latte, please don’t hurt me for writing this article. *This was added to address the fact that sugar is sometimes added to condensed skim milk, not removed from it.